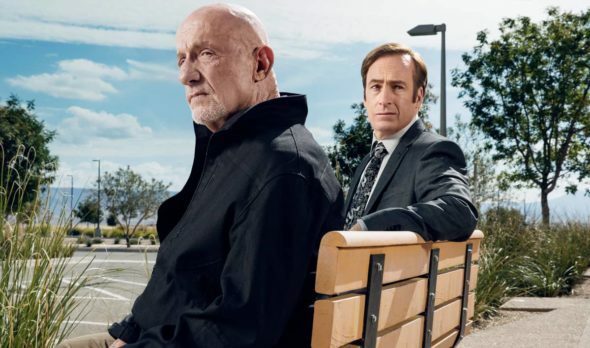 What can fans expect from the new season of Better Call Saul? Recently, creators Vince Gilligan and Peter Gould spoke with The Hollywood Reporter about the AMC TV show’s upcoming fourth season. A prequel to Breaking Bad, Better Call Saul stars Bob Odenkirk as Jimmy McGill, a down-on-his-luck lawyer trying to negotiate the ethical dilemmas of the legal world, emerge from his older brother’s shadow, and make a name for himself. The cast also includes Jonathan Banks, Michael McKean, Patrick Fabian, Rhea Seehorn, Michael Mando, and Giancarlo Esposito. Season four of Better Call Saul debuts on AMC on August 6th at 9 p.m. ET/PT. What do you think? Do you watch Better Call Saul? Are you excited for the new season? More about: AMC TV shows: canceled or renewed?, Better Call Saul, Better Call Saul: canceled or renewed? Better Call Saul: Season Four; Would You Keep Watching the AMC Series? One of the best shows ever………great in every way. Gilligan and Gould have hit another one out of the park. Great talent, great writing, real characters. Will miss Chuck though, loathsome as he was. Michael McKean fabulous. Whose to say Chuck is dead and didn’t put out the fire before it spread? Can’t wait for Season 4!!!! Love it and the teaser of meeting a “character” from Breaking Bad makes the anticipation even greater. Better believe I will be watching.